I walk down a quiet, Jasmine-scented road in the early morning sunshine and through the gates of a rambling villa, set in verdant hills, its pleasant, leafy garden spreading out on all sides with glimpses of the lake below. It is the sort of place a stressed-out modern bowler ought to retreat to. I could be in New Zealand or Italy or Sweden, except that, at 9am, the temperature is already a sweaty 28 C. Infact I am in Sri Lanka, on the outskirts of the bustling city of Kandy. I am greeted at the covered porch by a housekeeper and shown into a large, airy room with a small goldfish pond set into the stone floor. There is a familiar sound of young children clattering around in the kitchen and someone playing an out of tune piano. A friendly, middle-aged Sri Lankan woman offers me a cup of tea. Soon afterwards her son appears, looking a bit bleary eyed as if he has just got up. He probably has. He didn’t get away from the Pallekele stadium til after 10pm last night having eased the England bowling all around the park. This is the house where the world’s number one ranked test batsman, Kumar Sangakkara, grew up and learnt to bat and still returns for a regular check up when he’s in the country. Perhaps the place should be referred to as a laboratory. Because Kumar Sangakkara has got a Phd in batting. Since his Sri Lanka debut in 2000 he has turned art into science, analyzing and adapting and fine-tuning his method to score more international runs in the 21st century (almost 28,000 in all formats) than anyone else. I came to find out how he’d done it. 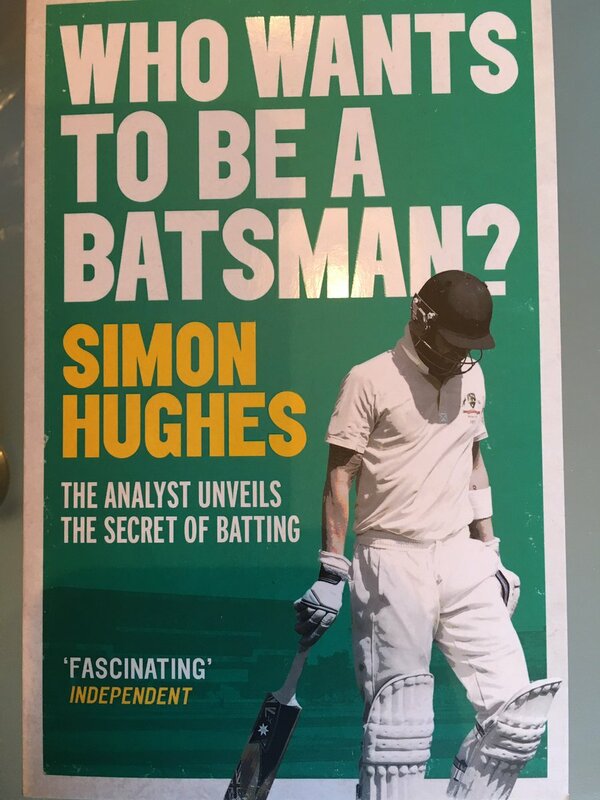 Using the book as a makeshift bat Kshema played the stroke as portrayed by Bradman, pirouetting on his back leg and hitting the imaginary ball along the ground. He was overlooking the fact that his son had made a previously faultless 91 the night before and, looking to accelerate in the last 10 overs, was only caught on the boundary edge when he attempted to plant Chris Woakes over deep square leg for six. Kumar smiled, accepting the criticism graciously. It was obviously a regular occurrence. (Infact there is a YouTube clip of a similar scene in the family home -https://www.youtube.com/watch?v=Sdx03cSJhHc ) Son has obviously inherited one ingredient from father: perfectionism. ‘The moment you see technique obviously in someone who’s batting I think that’s where someone’s not really flowing. When everything’s flowing you don’t see technique, you see style, you see grace, you see timing. That’s what I work towards. I don’t want to be fiddling or worrying about where my backlift is going, or whether my foot is going to the ball or how I balanced I am. I just want that flow. So batting is about rhythm, and flow. I have heard this many times before, most recently from the former Kent and Middlesex batsman Ed Smith who draws comparison between batting and chopping wood. He found when he tried to be short and precise with the swing of the axe and focus on a specific point on the log, he was quite clumsy. When he looked more vaguely at the log and just let the axe swing back languidly and brought it down fluently, he was much more accurate. He equates it with batting. When you bat in a relaxed manner – intuitively – you are liable to be much more successful than if you’re anxious and intense and too conscious of everything. Sangakkara’s reliance on the body’s natural rhythms is obviously invaluable. Where did get his understanding from, I wondered? ‘It comes from trial and error too. You watch other players, like Aravinda de Silva, Mahela Jayawardene, Brian Lara, Rahul Dravid, Ricky Ponting – you watch everything about them and you understand that when they do play at their best there is no stalling, no stuttering, it all flows. I tried to work out why that was and what they think about. Every player is different – the shots may be different but when they score runs there are a lot of similarities in the way those runs come.’ You could say he’s been as much a biologist as a batsman, microscopically examining every top player, dissecting their skills and adjusting his accordingly. Sangakkara deserves to be bracketed with any of the great players from cricket history. Never mind his mountain of runs, his test average (58.66) is the second highest of any batsman from the last five decades, including Tendulkar, Lara, Ponting and Sobers. And it is equally outstanding abroad as it is at home. And he has just become the first player ever to score four one-day hundreds in successive innings. Yet, unlike the others, he was no teenage prodigy. He actually wanted to be a pilot, and by his own admission, he was certainly not an exceptional player even in his early 20s. His phenomenal ability has been acquired through assiduous observation and painstaking practice. He is a great batsman who was made not born. He started with one slight advantage. He was left handed. Left handers have more fun. Facing predominantly right arm bowlers, they get more balls to hit – either pitching outside leg or offering width outside off – than right handers. Watching Australia’s Allan Border bat, 10 year old Michael Hussey obviously realized this and turned himself from right to left hander. Sangakkara was always a left hander. But as a teenager not a particularly good one. ‘Then I went to South Africa and batted number three again and got a half century in my first innings and a 98 in my last and I thought maybe I could do this! And I had a few decent series. But gradually the opposition sussed me out and were bowling at me in a particular way and blocking off certain areas, and I struggled and my confidence took a huge dip.’ He had more than two years without a test century. ‘But at 25 I had this epiphany where I suddenly realized a lot about myself. I realised the way I thought. I had a really good idea what my motions were like when I played well and when I played badly, I really took stock of what I could do and what I couldn’t (and there was a lot that I couldn’t do!) What I could do was quite limited. So I thought I’ve got to be able to improve what I can do, or hide my weaknesses for as long as I am able to, to score the runs I need. ‘Once I had that circularization about myself, and I wasn’t thinking about the opposition bowler or other players, that’s when my cricket started improving. Then I knew how to train, what to train, how to control my emotions in the middle, how to let my instincts take over and be a reactive batsman. That’s the best way to do it. How to not worry too much about technique. In training I get my rhythm and my confidence and everything is in sync so when I go into a match I’m just playing. Aha, a solid base. Where’s that when you need it…..? ?